The New York State Education Department recently awarded a five-year, $1.63 million grant to SUNY Oswego's School of Education to scale up and enhance its Teacher Opportunity Corps program, which seeks to attract and retain teacher candidates from underrepresented groups -- particularly young men -- in high-need schools. The $325,000 a year in funding through the state's My Brother's Keeper program will more than double the capacity of Oswego's nine-year-old Teacher Opportunity Corps (TOC) to serve 50 students, from freshmen through graduate school, and to support graduates in their early years of teaching. Enthusiastic about the competitive award, Dr. Pamela Michel, dean of the School of Education, said the grant would provide important financial, social and professional support to encourage more students of color to become teachers. She emphasized that the School of Education has long nurtured underrepresented teacher candidates and developed programs that do so with consistency, caring and rigor. "We have a conceptual framework, a collective vision, with teaching for social justice and authentic learning at the core," Michel said. "We have created programs that have the potential to encourage our students to embrace the world in all its diversity, and to make a commitment to become part of it as teachers, administrators, counselors and leaders in education." The new grant will support freshmen through juniors -- among other new and ongoing initiatives -- with experiences in schools in partner school districts, setting the stage for the program's clinically rich senior year, when teacher candidates do a yearlong residency immersing them in high-need school communities. Educational specialist Nichole Brown, the School of Education's field placement director and the principal investigator for the My Brother's Keeper grant, said the school expects to recruit at least 50 students, from freshman through graduate level, for Teacher Opportunity Corps. "We are fortunate to have received this funding to be able to continue our work to recruit, prepare and graduate more students of color to diversify the teaching workforce," Brown said. "With the additional funding and scope of this grant, we will double the number of students we will support, and will now be able to support freshmen. We could not support freshmen, except socially, before. We can now add freshmen to our roster, to make sure they are ready to start this education journey." Sherade McKitty, who earned both her undergraduate and graduate teaching degrees at SUNY Oswego, said her arrival in the United States from her native Jamaica was a "huge culture shock." She had only her senior year in a Yonkers high school before she was off to college. "TOC made my time at Oswego so much easier," she said. "EOP (the Educational Opportunity Program) and TOC really made me feel at home. TOC pretty much became a family for me." Now a ninth-grade English and 12th-grade English Regents preparation teacher at Careers in Sports High School in south Bronx, McKitty said she got vital advice from administrators, teachers, mentors and peers in Oswego's TOC program, as well as opportunities for immersive experiences at Fowler High School and Ed Smith K-8 School in Syracuse and, during graduate school, at Camillus Middle School. "SUNY Oswego and TOC made me believe I could accomplish all that I have accomplished," she said. Harlem resident Emilio Del Valle, now a senior teacher candidate with experience at Syracuse's Henninger High School and Paul V. Moore High School in Central Square, agreed that the TOC social support is crucial for attracting and retaining students of color to teaching. "We have meetings and go over certification requirements," he said in an interview last spring. "It's really big on supporting each other. For the first hour, we do something called check-in. We go over everything that's going on in our personal lives." Madison Shaw recently completed her undergraduate degree following a TOC residency with Syracuse City School District, first at Bellevue Elementary and Fowler High schools, then in a Grant Middle School classroom serving students learning English as a new language. Shaw co-taught classes with 26-year veteran teacher Angela Alessandro. "Madison is wonderful," Alessandro said. "She is going to be an excellent schoolteacher. She's got that teacher presence about her." Shaw, who has been hired to teach this fall at Dr. Weeks Elementary School in Syracuse, said that while in-class mentorship such as Alessandro's is crucial, TOC helps in many ways. "I think it's great. It especially provides more support for teacher candidates for specific costs, such as textbooks, certification testing and transportation." Brown said the TOC grant would strengthen its partnerships with numerous school districts, such as the Syracuse City Schools and the Bronx-based Eagle Academy for Young Men, and with the college's admissions programs. Among other initiatives, TOC will work to help create a "grow your own teacher pipeline" in schools and districts. "We will increase focus on recruiting candidates from underrepresented groups and economically disadvantaged candidates, paying more attention to opportunities to recruit more males," she said. TOC will increase mentorship and structured programming, Brown said, and help candidates reflect on their own learning in meaningful ways as they prepare to teach in urban school districts. For more information on Teacher Opportunity Corps at SUNY Oswego, contact Brown at nichole.brown@oswego.edu or 315-312-3098, or visit the School of Education's TOC site at https://www.oswego.edu/field-placement-office/teacher-opportunity-corps-toc. 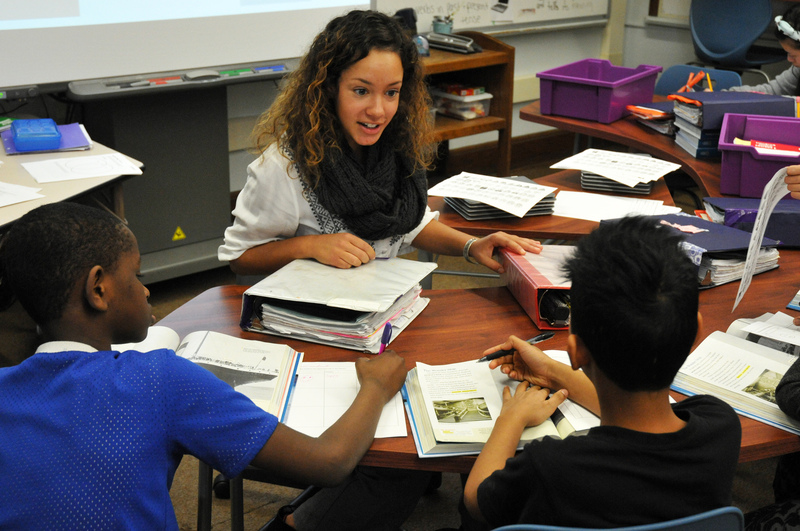 Teacher opportunities -- Madison Shaw, a member of the SUNY Oswego School of Education's Teacher Opportunity Corps, works this spring with English language learners at Grant Middle School in Syracuse. Oswego's TOC program, which seeks to attract and retain students of color to teaching careers, recently was awarded a five-year, $1.63 million grant through the New York State Education Department's My Brother's Keeper program.